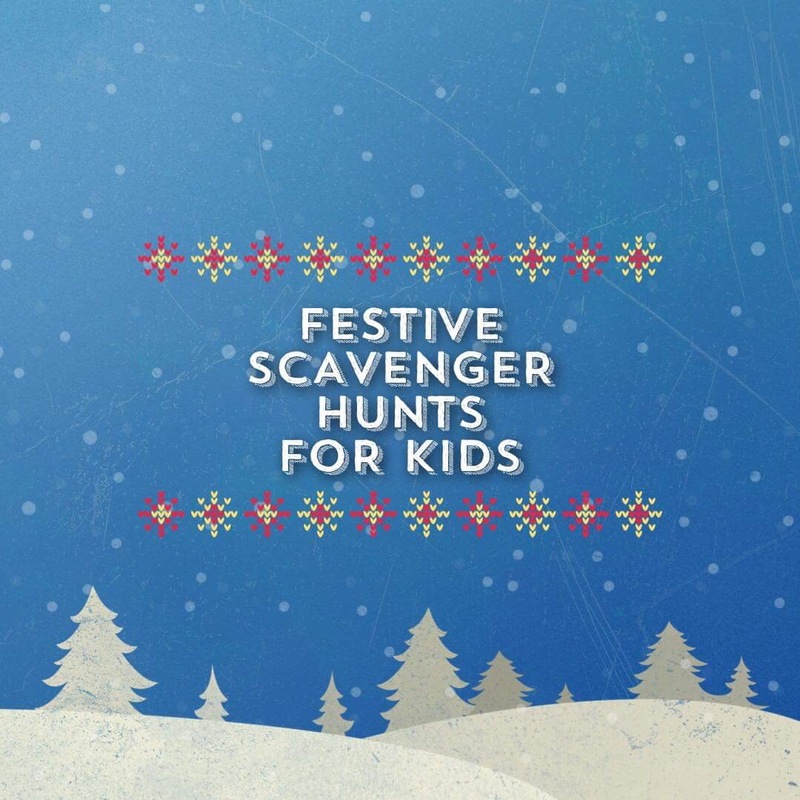 Children love a good treasure hunt and Christmas is the most ideal time to have some fun. 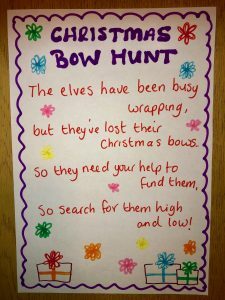 And if you find yourself doing Elf on the shelf then these hunts are ideal to use! With lots of our treasure hunts being extremely popular with our followers and oodles of fun to recreate, we have listened to you and made all of these hunts available for you to print yourselves. I’ve also included some sources for you to purchase some of the items that you may like to do your hunt with too. (We may get a small commission if you buy from these.) Of course, if you fancy heading to the shops, you should be able to find the items there too. 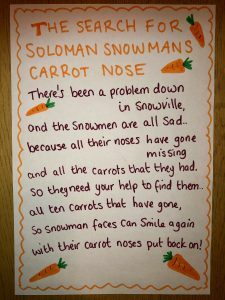 For this one, you just need a cheap bag of carrots! We used up a bag we already had in the fridge so it didn’t cost anything to have some fun. 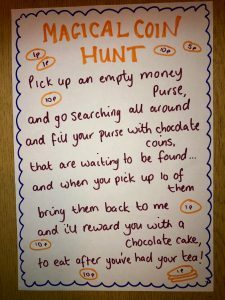 Click the link (or the image) for your printable Carrot Search treasure hunt sheet. We used this box of sleigh bells and tied a scrap of red fabric to each. You could use red ribbon, wool or string too. Or keep it simple, and just hide the bells as they are. 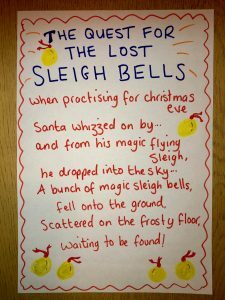 Click the link (or the image) for your printable Lost Sleigh Bell hunt sheet. Love them or hate them, Brussel sprouts can make a fun scavenger hunt! We’ve done this hunt with the uncooked leftover Brussel sprouts after Christmas dinner. Or you could use chocolate sprouts! 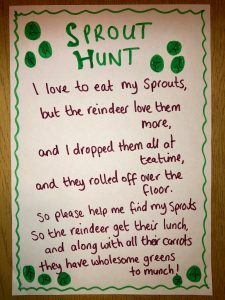 Click the link (or the image) to get your printable Sprout Hunt sheet. We used reusable plastic candy canes for the hunt. When they were all found, we hung them on the tree and swapped them for a treat. 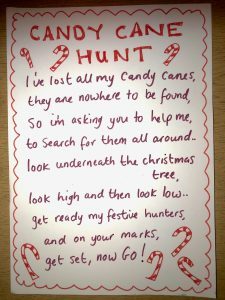 Click the link (or the image) to get your printable Candy Cane hunt sheet. This is a fun idea to keep the kids happy while dinner is cooking. 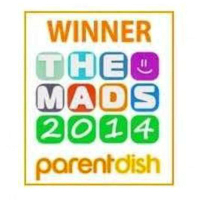 We used these chocolate puddings for the hunt – they were a total hit! 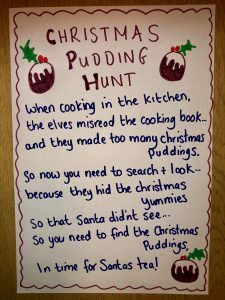 Click the link (or the image) for your printable Chocolate Pudding hunt sheet. As we can’t guarantee the amount of snow needed for this, we used these Indoor Snowballs. They were perfect! 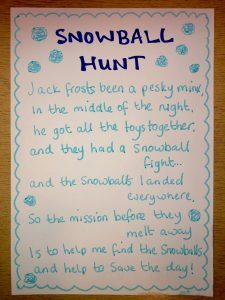 Click this link (or the image) for your printable Snowball Hunt sheet. You could use real coins, of course, but these shiny cheap gold treasure coins, are handy as they’re reusable (and you don’t have to worry about losing money around the house!) Or go for the classic chocolate coins as that always makes the kids search more. 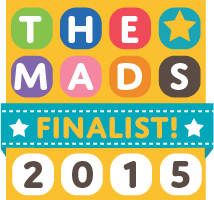 Click the link (or the image) for your printable Magical Coin Hunt sheet. 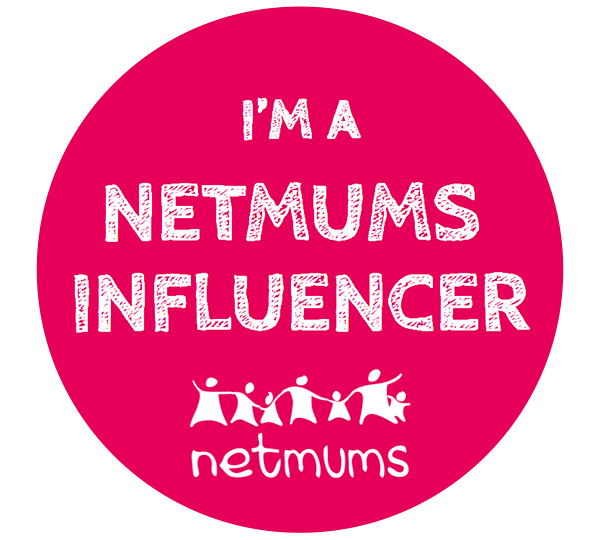 This is noisy fun! You can buy Christmas crackers in Pound stores for the best value. 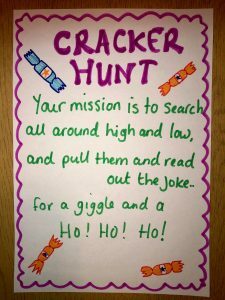 Click this link (or the image) for your printable Christmas Cracker hunt sheet. Click the link (or the image) for your printable Gift Bow Hunt sheet.